When I transitioned from using printed repertories to computer repertories, I was surprised that the computer repertory followed the exact same structure as the printed book. 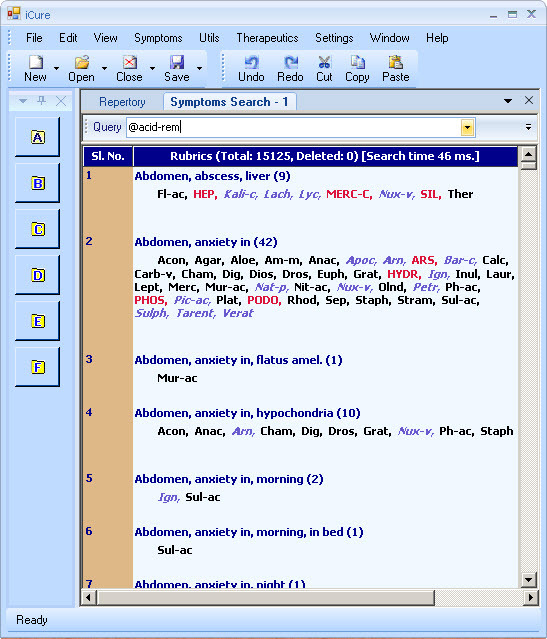 The software allowed you to look for a rubric following the same approach you would in looking for the rubric in the printed book: the chapter, section, sub-section, etc. 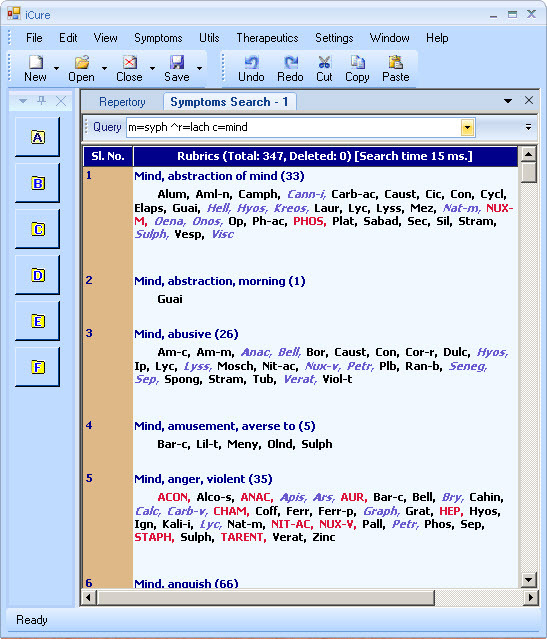 Searching for a set of rubrics based on words and word stems was available, but in a limited form. 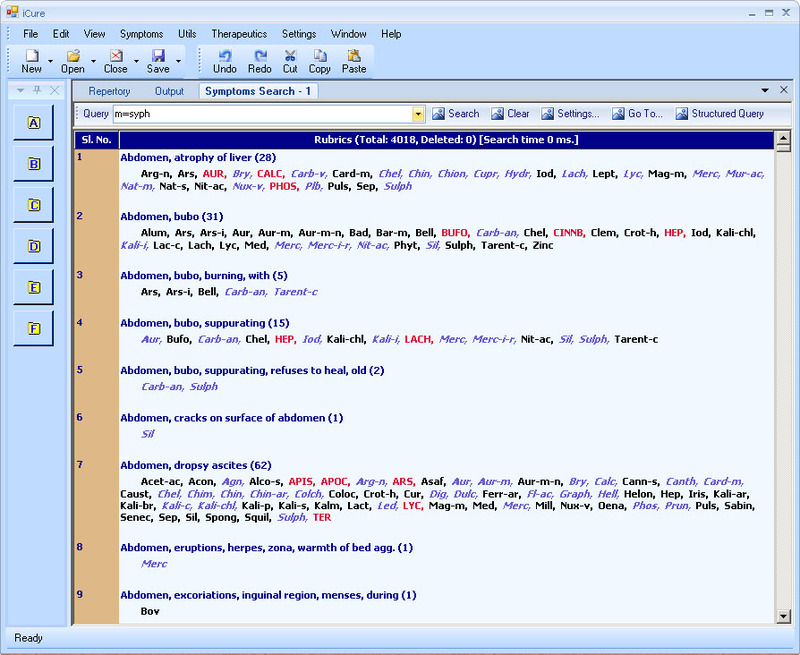 I was very keen to provide enhanced rubric search capabilities when I started work on iCure. It was not an easy task, but I managed to include support for some interesting forms of searching. In this post, I am going to share a few of the search options in iCure. 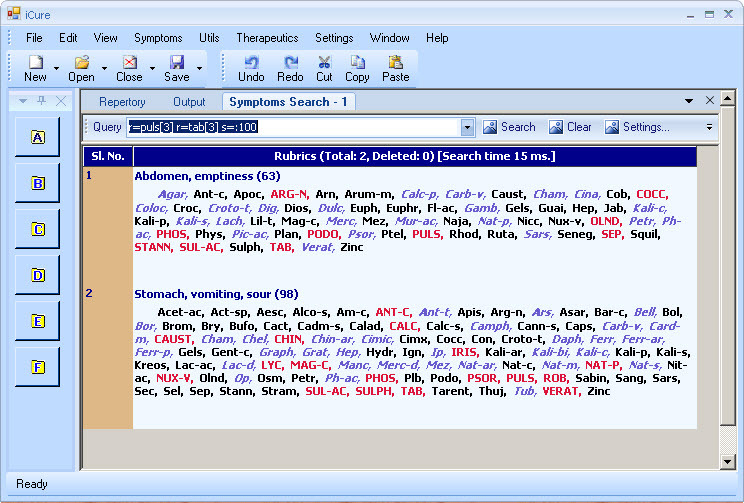 Most computer repertories support this type of search, so there is nothing special in iCure in this case. Let us search for rubrics where Pulsatilla and Tabacum are present in the 3rd degree and the total number of remedies in those rubrics should be no more than 100. Enter the search string “r=puls r=tab s=:100”. Now let us look for rubrics that denote a syphilitic tendency. The search string is “m=syph”. This search is interesting because it takes advantage of one of the many rubric annotations of the Kent repertory built into iCure. I believe such annotations add great value to the homeopath. Of course, we can add other conditions to this search string. Consider this: “m=syph ^r=lach c=mind”. This query asks for rubrics that show syphilitic tendency in the Mind chapter but without the remedy Lachesis. See figure. Another example of annotation is looking for rubrics that denote “Dreams”. The corresponding query is: “t=dream”. 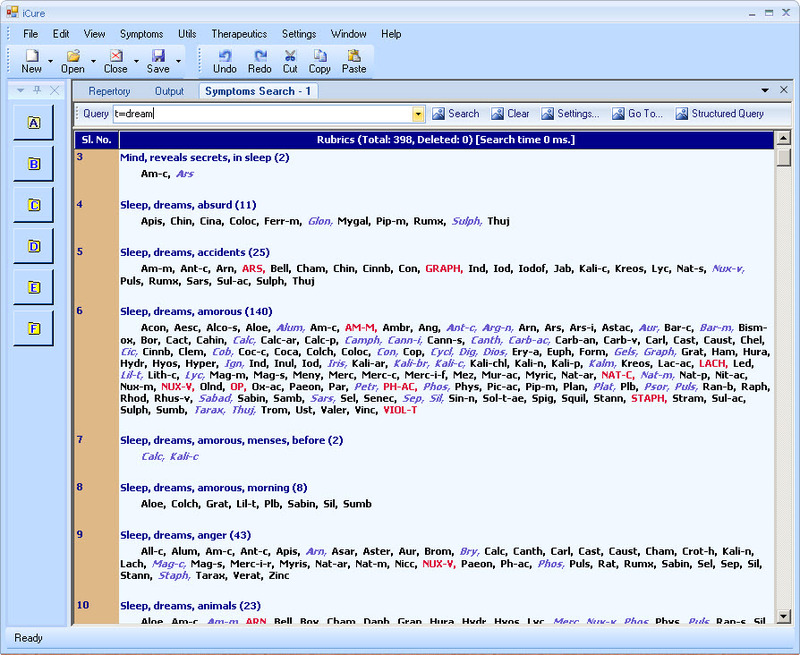 You can see that the first rubric in the figure does not have the word “dream” in the rubric text, nevertheless, it is considered a dream-related rubric. Another very powerful query feature pertains to what is called a “macro” in iCure. When your query string gets complex, you can give a name to it and use that name instead of the whole string. This is called a macro. Many macros come pre-defined and you can add your own. For example, if you want to look for rubrics that contain the Acid remedies (Nitric Acid, Phosphoric Acid, Sulphuric Acid, etc. ), you can enter the string “@acid-rem”. The “@“ prefix causes iCure to expand the macro name and the use its full search expression. This is very convenient, especially if you want to define your own classification. See the following figure. 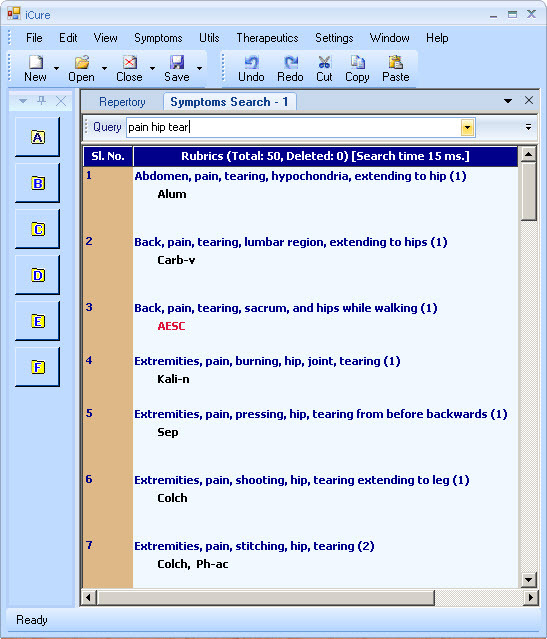 The above examples are just a few of the search capabilities of iCure. I had planned far more advanced search capabilities, but could not implement them due to lack of time.